With wonderful large leaves to nearly 50 cms across Tetrapanax papyrifer is commonly called the ‘Rice Paper Plant’. 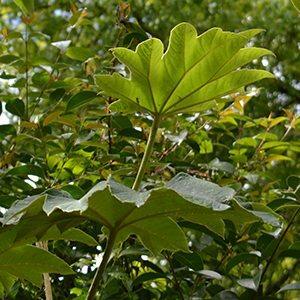 A great foliage plant with large palmate (divided into lobes) leaves add texture and interest to the garden. This is also a tall growing plant, quickly reaching over 2m in height, as such it can be grown at the back of the border to add a little height. Tetrapanax is a suckering shrub with unbranched canes or stems, the leaves are a glossy green, flowers are small and white Tetrapanax prefer a well drained humus rich soil. Tetrapanax can be used to give the garden a tropical look. Over time, in ideal conditions T. papyrifera can reach around 5m in height, however in cultivation around half this is more usual. It will send out runners, however they are easily removed. Very easy to grow in a humus rich well drained soil. For us it grows in both full sun and part shade. The whole plant can be pruned right back to the ground after flowering to help maintain a smaller size. Once established this is really a ‘no care’ plant’. The common name of Rice Paper Plant is a reflection on its use in China to make paper.